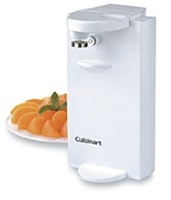 An easy-to-operate can opener with an elegant sense of style that is pure Cuisinart®. One touch opens cans of any size and the entire unit can be wiped clean in seconds. This indispensable tool is the perfect addition to your Cuisinart kitchen.